Three gun traffickers are accused of using Facebook to illegally sell guns from Virginia to suspected gang members on the streets of New York. ATF agents, along with detectives from the NYPD and Newport News, Virginia, made arrests in the early morning hours Wednesday. Joesph Johnson, Brianna Glee and Tyshon Stephens are accused of trying to sell over 40 guns in New York. Prosecutors said some of the ring’s customers were gang members and past felons looking to commit new crimes. ATF New York Director Ashan Benedict said the group often "put firearms into the hands of individuals that should not possess them." Police said the ring was part of the I-95 “Iron Pipeline,” where guns from southern states are illegally trafficked to New York, a city with strict gun laws. U.S. Attorney Richard Donoghue said ringleaders used straw buyers to get the guns before they would be sent to New York. The suspects face up to 20 years in prison if convicted. 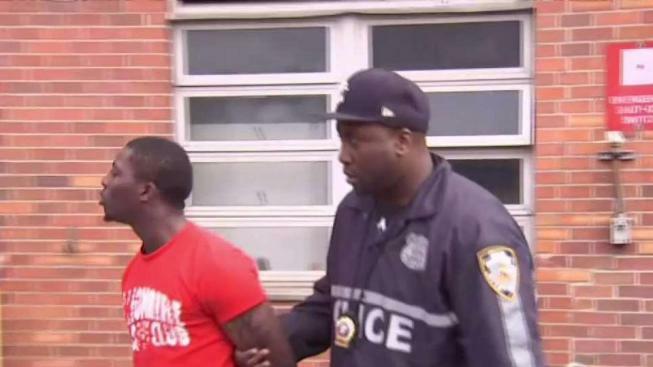 ATF agents and NYPD officers also targeted a violent Brooklyn street gang on Wednesday. Fifteen suspected members of the “Boss Crew” were arrested on federal drug charges. They were later led away to court in handcuffs. The gang accused of selling cocaine and heroin and using guns and violence to enforce their turf around Bed-Stuy. Officials said the gang at times “terrorized” not only rivals but everyday residents. Police said Tyshawn Burgess, also known as “Ty Black”, is the gang’s ring leader. If convicted, he and the others face up to ten years in prison on the drug conspiracy counts.